Note: Both versions of our lessons display nicely on most small screens. Our "Mobile" version ( ), which links to BibleGateway, works better for some mobile devices. The main version, using Reftagger from Biblia.com works better for other mobile devices. So experiment and take your pick. (We're interested in what works best for you. Write to us through our "Contact" link and be sure to tell us with what device you are accessing our lessons.) The Study References ( ) include all related Scriptures and context for most EGW quotations. ©2015 General Conference of Seventh-day Adventists®. All rights reserved. No part of the Adult Sabbath School Bible Study Guide (Standard Edition) may be edited, altered, modified, adapted, translated, reproduced or published by any person or entity without prior written authorization from the General Conference of Seventh-day Adventists®. The division offices of the General Conference of Seventh-day Adventists® are authorized to arrange for translation of the Adult Sabbath School Bible Study Guide, under specific guidelines. Copyright of such translations and their publication shall remain with the General Conference. Seventh-day Adventist, Adventist and the flame logo are registered trademarks of the General Conference of Seventh-day Adventists® and may not be used without prior authorization from the General Conference. The Adult Sabbath School Bible Study Guide is prepared by the Office of the Adult Bible Study Guide of the General Conference of Seventh-day Adventists. The preparation of the guides is under the general direction of the Sabbath School Publications Board, a subcommittee of the General Conference Administrative Committee (ADCOM), publisher of the Bible study guides. 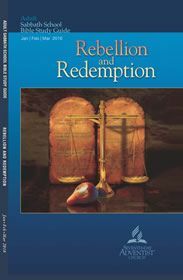 The published guide reflects the input of a worldwide evaluation committee and the approval of the Sabbath School Publications Board and thus does not solely or necessarily represent the intent of the author(s). NIV. Scripture quotations credited to NIV are from the Holy Bible, New International Version. Copyright © 1973, 1978, 1984, 2011 by Biblica, Inc. Used by permission. All rights reserved worldwide. NKJV. Texts credited to NKJV are from the New King James Version. Copyright © 1979, 1980, 1982 by Thomas Nelson, Inc. Used by permission. All rights reserved. Do you need a paper Sabbath School Quarterly? Or maybe you would like a Kindle edition of the lesson or the Ellen White Notes. You can find all that and more besides in the Sabbath School Net Amazon Store. Do you know that you can receive each day's lesson via email? You may also discuss each day's lesson with other Sabbath School lesson students on our blog.